Vertigo is a disease that affects the central nervous system of the body and during the onset of Vertigo, there will be dizziness, and the patient feels like reeling and may even fall down. At times vertigo may be mild but on many instances it may be severe and the patient may even vomit and fall unconscious due to the dizziness.A complex mechanism of the body which consists of inner ear, skin, eyes and central nervous system of the body regulate the body’s balance. For example, the fluid inside the inner ear helps an individual to maintain his/her direction, while eyes coordinate to send information to the brain regarding the spacing with other objects. 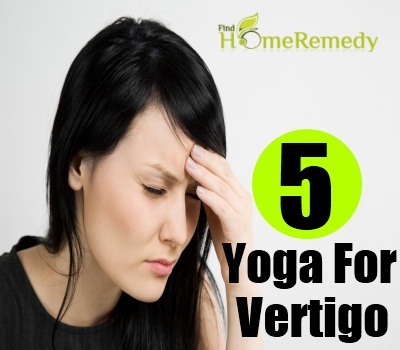 Whenever, there is an imbalance either in inner ears or in central nervous system due to allergic reaction to dust, food, or due to poor blood circulation or due to infection, vertigo may develop.Vertigo should be treated immediately; else it may lead to more complication and hence is potentially dangerous.Yoga is a very effective and natural remedy for vertigo. Yoga posture designed for vertigo helps to strengthen the central nervous system, improve the balance, enhance blood circulation and cultivate your concentration and focus. Hence, while joining for yoga let your teacher know about your vertigo and this help he/she to customize poses for you. Apart from yoga postural exercises, you need to follow breathing exercises and meditation. Squat on the haunches with the feet kept wider than your trunk. While taking this position the heels and soles should touch the floor completely. Then, slowly raise the seat and move the trunk forward till the armpits cross the knees. Thereafter, bend forward and grab the back portion of the ankles. Once you hold the ankles, breathe out and move your head down towards the toes and keep the forehead on the toes. Maintain this pose for a minute and then breathe in and slowly raise the head. Now release the hold on the ankle and relax. Again breathe out and bend the waist forward while keeping the hands extend backwards and keep the head on the floor. Hold this position for about a minute with normal breathing. Breathe in to raise the head back to the normal position and release the hands. Practice this pose daily to get rid of vertigo. Lie down flat on your back and stretch out the legs straight on the floor. Keep the arms on the sides of the body with palm facing the floor. Thereafter, inhale and raise both the legs together to 90 degree angle. Now exhale and continue the movement of the leg towards the head. If you are able to touch the floor behind the head with your toes, that will be the ideal posture else move your legs as close as possible to the floor behind the head. Maintain this pose till you make eight deep breaths through your nose. Thence, slowly take the legs back to the starting position and relax. Sirsasana helps to improve the blood circulation, enhances the clarity of thought, decrease fatigue and enhances the equilibrium. In order to proceed to head stand pose, sit in vajrasana or squat on the floor, facing a wall with the toes pointing backwards. Bend forwards and keep the hands folded at shoulder width apart on the floor. Make a triangle with the interlocked fingers and elbow and place the head slowly on the floor within the triangle. Then slowly lift the heels, buttocks and hips and stretch the spine from the top of the head to the tailbone and similarly straighten the back of the legs from the buttock bones to the heels. Then, take the feet close to the torso without bending the spine and legs. Thereafter, lift the legs and touch the wall behind with the heels. You can also keep your hips on the wall. Slowly adjusting the forearms and wrist, firm the shoulder blades and stretch the leg away from the body with the help of the ball of the feet. Hold this position for a few seconds and return back to the normal posture by bending the knees and lowering the legs. Touch the floor first with the toes and then slowly bend the knees and allow the feet to rest on the floor. Thereafter, lower the hips and buttocks and attain a child’s pose for a few seconds else, it may cause lightheadedness and dizziness. Hence, attain a normal head upright position gradually. Once you can do head stand easily with the support of the wall, then practice it without the support of the wall. Shavasana helps to recover from negative thoughts, tiredness, nervous system disorders and depression. It helps the body to rest completely and rejuvenate. Start the corpse pose by lying down on the back on the floor with your hands kept beside the body, but not in contact with the body. Legs should not touch each other. Thereafter, close the eyes and relax the spirit and mind by deeply and steadily breathing in and out. Then start concentrating on different parts of the body starting from the toes to head. If you feel sleepy during corpse pose then increase the breathing speed. You can practice corpse pose till you feel comfortable. 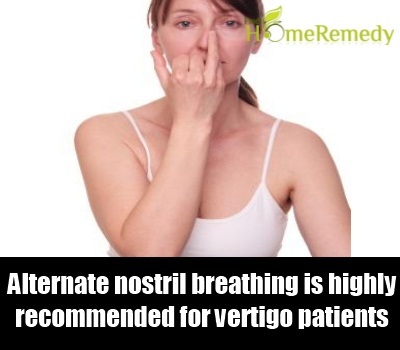 Alternate nostril breathing is highly recommended for vertigo patients, as it increases the supply of oxygen to the brain and other parts of the body, which then calm down the nervous system, increases the energy, metabolic rate and concentration of the practitioner. Sit straight on a flat surface with closed eyes. Keep both the palm facing upwards on the appropriate knees and first close the right nostril with the right hand’s thumb. Then slowly breathe in through the left nostril till the lungs are filled with air and thereafter close the left nostril with the second and third fingers and breathe out through the right nostril. Then repeat the exercise by closing the left nostril and gradually increase the speed and force of breathing and chant the “OM” mantra while doing this exercise. Practice five to ten minutes of pranayama daily either in the morning or evening.Practicing yoga daily helps you to reduce the symptoms of vertigo.